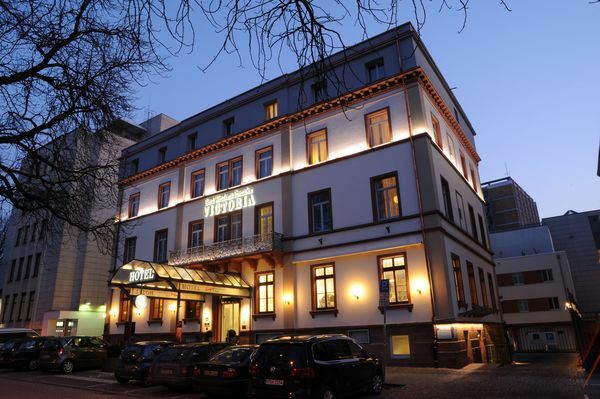 Overnight stays without carbon footprint: The Best Western Premier Hotel Victoria is an especially ecofriendly 4 star city hotel in the heart of Freiburg. Located in the center of the town just a few minutes‘ walk from the central station and the historical town center. The whole hotel takes its energy exclusively from renewable energy sources... and has EMAS, Viabono and Green Brands accreditation. One of three bicycle priority routes of the Cycling Concept 2020. 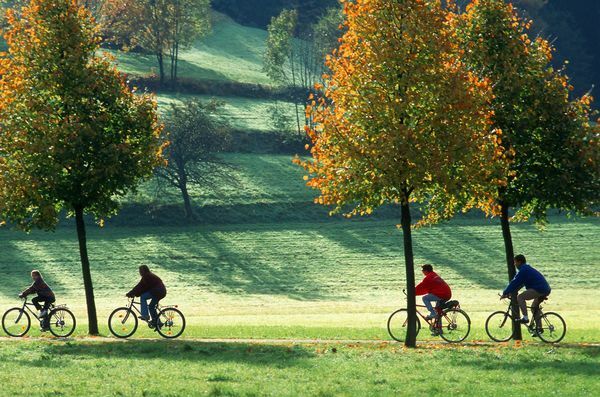 Even over longer distances the bicycle priority routes will make cycling more attractive and especially fast and safe. The bicycle priority route FR1 was completed with state subsidies, the foot traffic was cut off to some extent. It has priority almost in the entire urban area (e.g. on Sandfangweg). Up to 15,000 cyclists use the route on fine days. 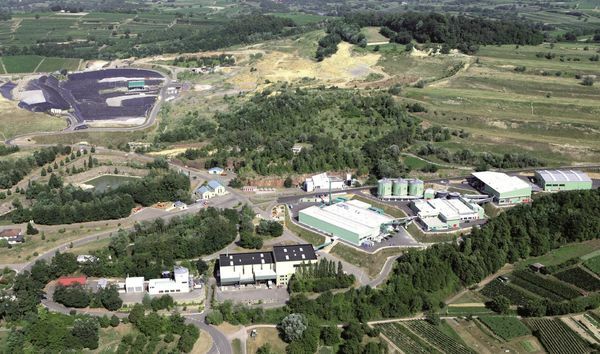 In RETERRA‘s organic waste fermentation plant each year roughly 36,000 tonnes of organic waste are processed into renewable energy. The resulting biogas is subsequently mixed with gas from the land-fill site at the former waste disposal site at Eichelbuck before being piped to a CHP (combined heating and power station) in the district of Landwasser. This is enough to provide roughly 4,900 households with electricity each year, as well as 1,200 households with heating. 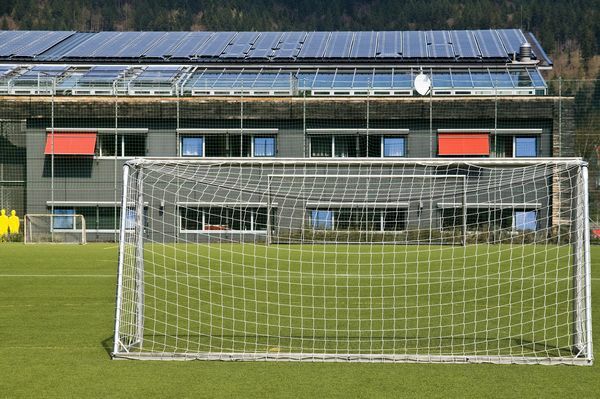 SC Freiburg‘s stadium was Germany‘s first solar stadium. 2,200 m² of the stadium‘s roof is covered by solar panels which produce a total of 275,000 kWh of energy per year. This saves roughly 136 tonnes of CO2 annually. The aim of the campaign, is to achieve a neutral carbon footprint for the stadium. This is part of a larger campaign promoting a new era in energy production. 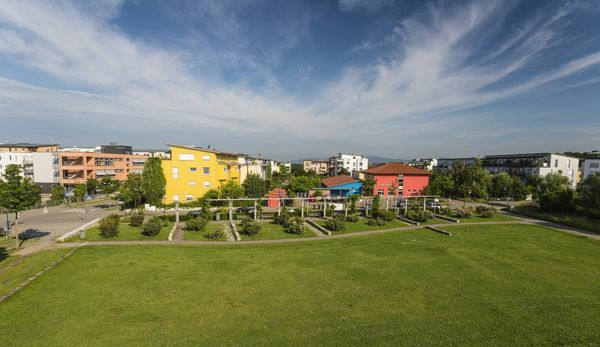 In the most popular recreational area of the city is a solar power plant with a performance of 30 kWp. 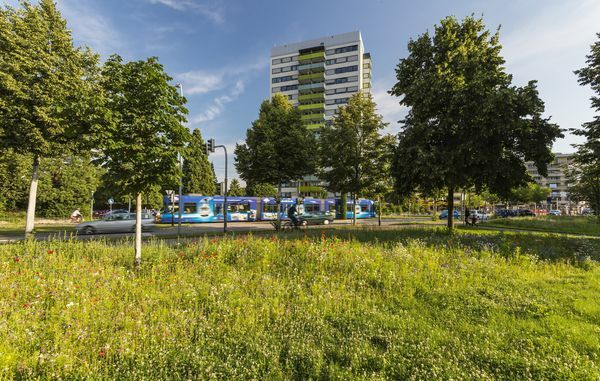 As the winner of the competition "Federal capital in climate protection" in 2010, the city of Freiburg received the plant as a prize. 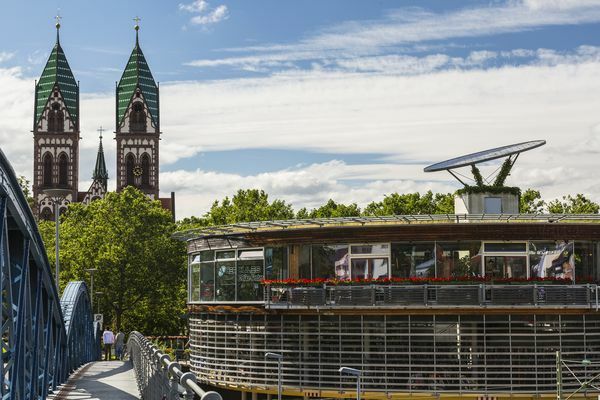 The proceeds of the solar power have since then flowed into the Freiburg Environmental Award. 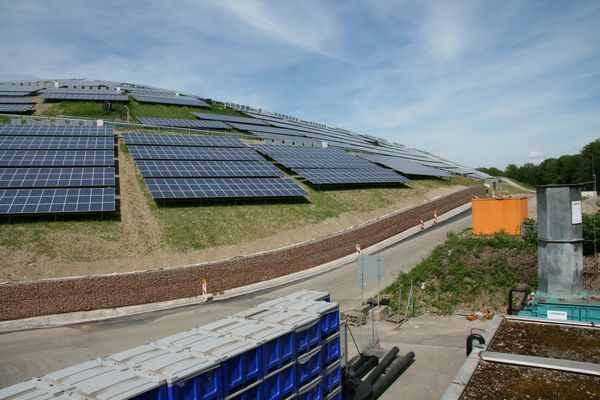 Freiburg‘s largest solar energy installation situated on this former waste disposal site went on stream at the end of 2011 and provides, with its total output of 2.5 Megawatt Peak (MWp) enough electricity for 1000 households. The gas from the landfill site is drawn off and mixed with biogas from an organic waste fermentation plant, piped to a combined heating and power station (CHP) in the district of Freiburg-Landwasser and then used to produce electricity and heat. The Fraunhofer Institute for Solar Energy Systems ISE, with its about 1,100 employees, is Europe‘s largest institute for solar research. The work extends from research of the scientific basis of solar energy use and the development of prototypes to the implementation of showcase systems such as the solar hydrogen filling station in Heidenhofstrasse. 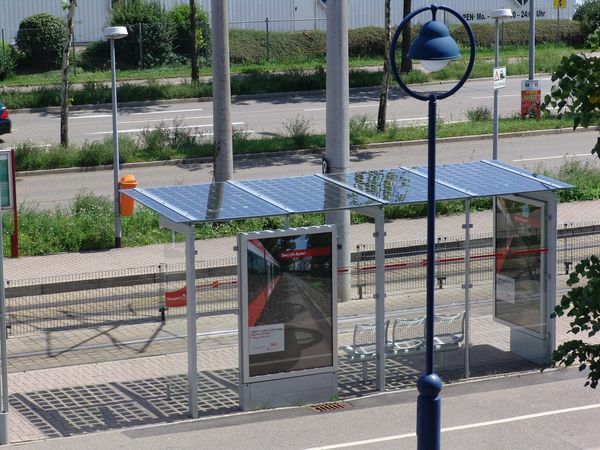 The tram stop ‘VAG Zentrum‘ is the first station on the network which is equipped with a solar energy system on its roof. Since 2009 the tram network has taken its energy supply from clean power sources and thus produces zero emissions and is ‘climate neutral‘. What‘s more, energy produced as a result of braking is used within the tram and any surplus is fed back into the grid. 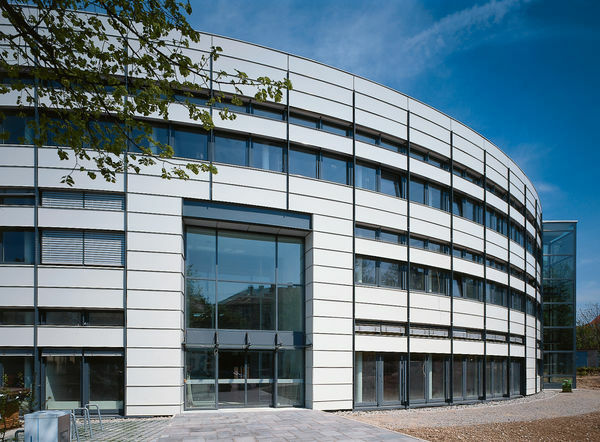 Freiburg University Library reopened in its new, energy-efficient building in July 2015, and is now one of the largest and most modern university libraries in Europe. The University Library offers excellent service and the best possible environment for learning and working. 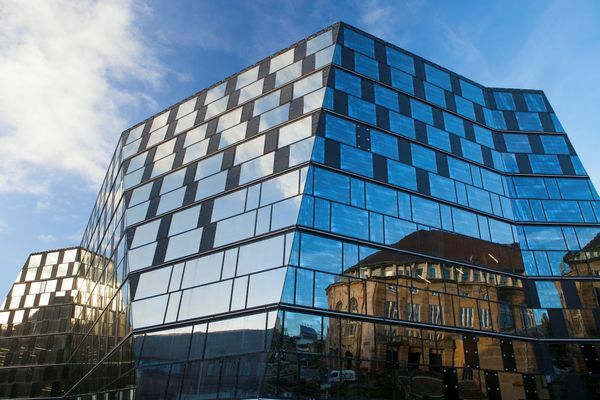 The new building was designed by Degelo, a firm of architects in Basel, and has with a transparent metal and glass façade – part of an innovative light, power and air conditioning concept. 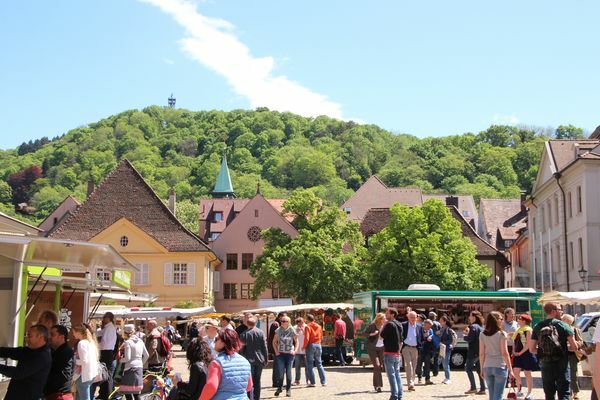 The "Green Industry Park Freiburg" initiative, launched in February 2014, promotes the networking of committed companies and individual company solutions and supports the joint development of innovative projects as well as the use of potential savings and cooperation possibilities. 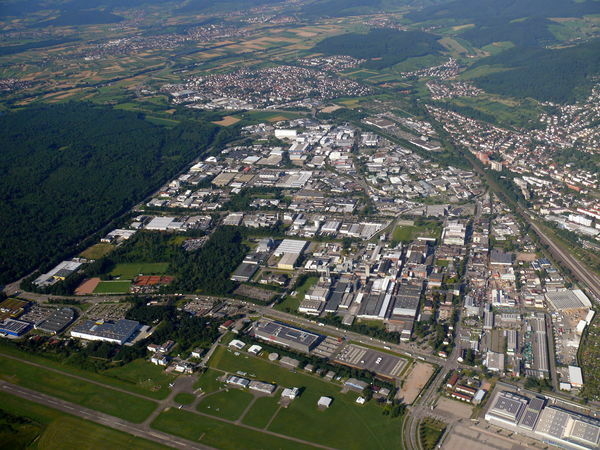 In this way, an own climate protection concept was developed for the industrial area North as one of the first large industrial areas in Germany. The Green Spots 19 until 23 on picture 2 are part of "Green Industry Park". 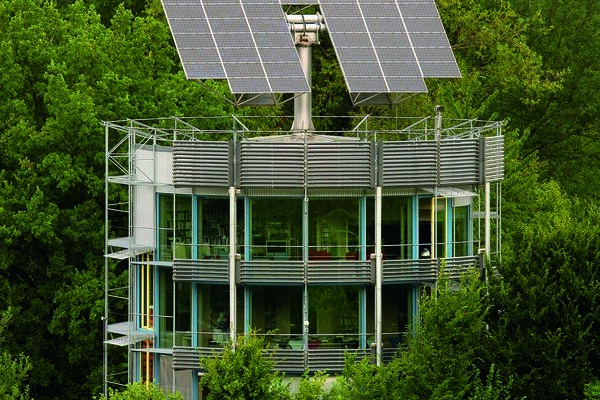 The Heliotrop was the very first plus-energy house in the world and produces three times more energy than it uses. 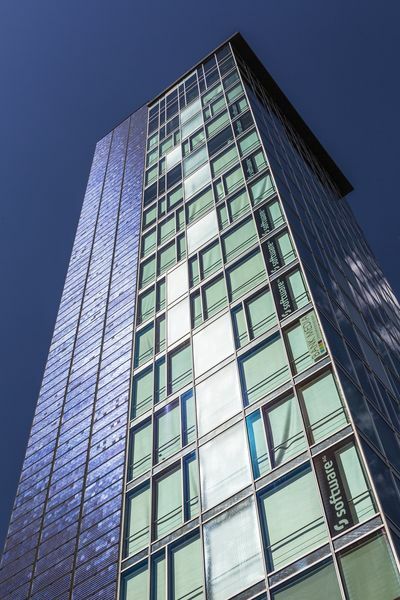 As a rule it follows the path of the sun from east to west so that the glazed exterior catches as much sunlight as possible. However, on hot days it can also make use of an integrated insulated wall in order to provide itself with shade. 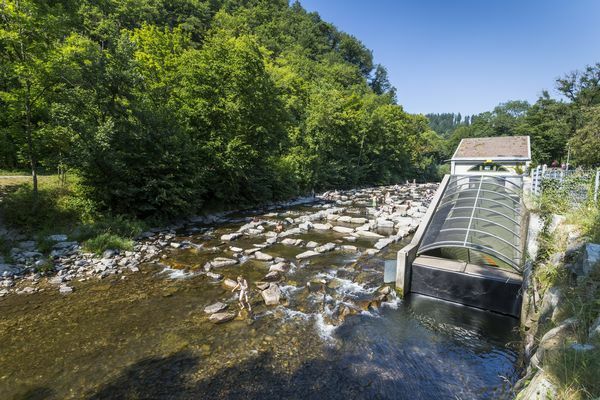 This hydro power plant at Sandfangweg was switched on at the end of 2008 and produces on average 300,000 kWh per year. Due to its innovative construction resembling a snail the turbines require only a slight downhill gradient. On the Dreisam river this equates to a drop of about 3 meters. 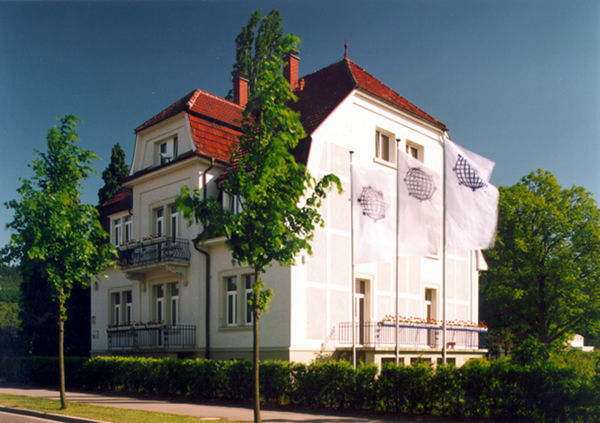 Villa Tannheim, which dates back to the Wilhelminian era, is the seat of the International Solar Energy Society (ISES). 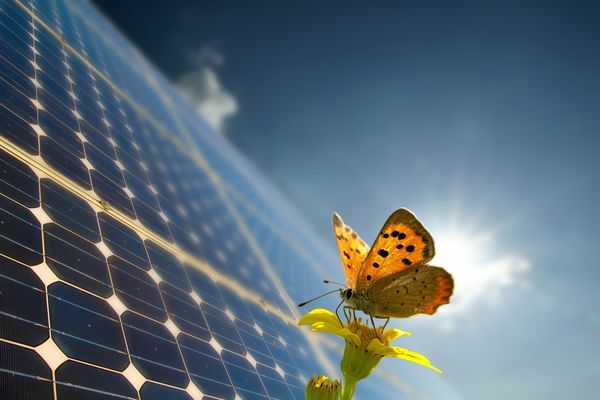 The association works for the worldwide use of 100% renewable energies, especially solar energy. Villa Tannheim is a prime example for energy-efficient building restoration: external thermal insulation, transparent thermal insulation, Isofloc in the roof construction, triple window glazing, solar collectors for heat, SolarCarport, wood pellet heating. 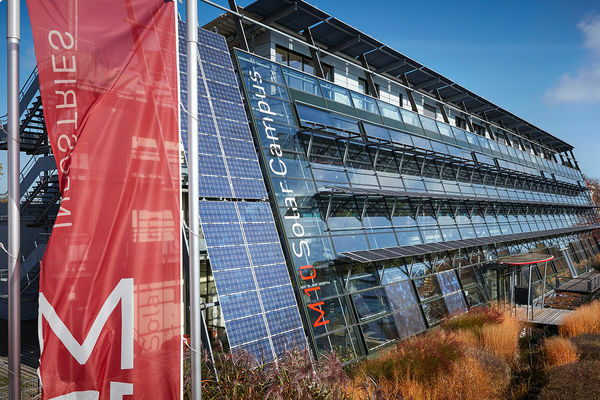 The new competence center “M10 Solar Campus” combines development with production and technology: M10 Industries AG develops and builds systems for the solar industry. SI Module GmbH produces high-quality photovoltaic modules “Made in Germany”. As an M10 Industries subsidiary SI Module also serves as a technology and service center for the new high performance stringer “Kubus”. Photovoltaic systems with a total output of more than 200 kilowatts are installed on the building complex. 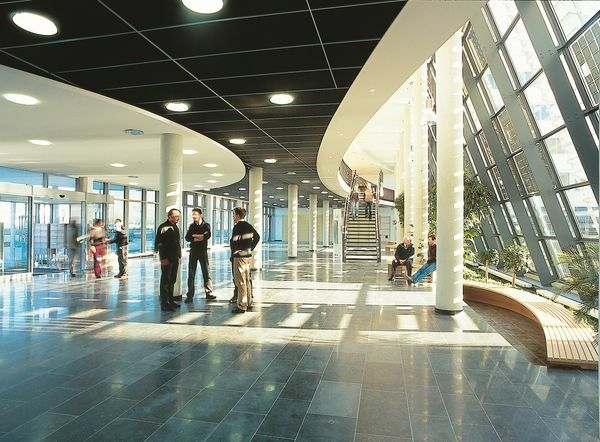 In the competence center for renewable energies and energy efficiency, 40 companies offer products and services from local to global energy transition. The platinum-certified SIC (LEED 2013) provides its tenants and visitors with an energy-efficient building with an exemplary energy concept at conventional costs. Among other things, the concept is based on geothermal energy, photovoltaics, solar thermal energy and a natural cooling system. Built according to passive house specification, with a photovoltaic system installed on the roof, and with natural air-conditioning, the Solar Ship and the Solar Settlement are plus-energy constructions. Put simply, that means that they produce more energy than they use. What‘s more, the Sun Ship is a wonderful example of a multiple-use building: apartments, businesses and shops can all be found here. 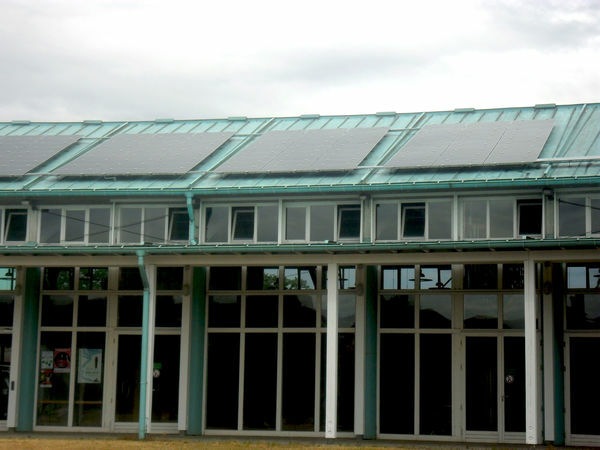 The school demonstrates its appreciation of renewable energy in more ways than merely with the photovoltaic system they have had installed. 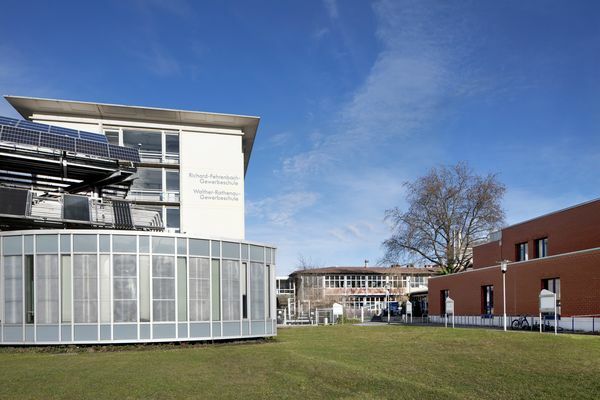 The solar tower with its highly modern cooling and heating systems, a hydroelectric facility and mini CHP units all supplement the school‘s efforts to produce energy from renewable sources. 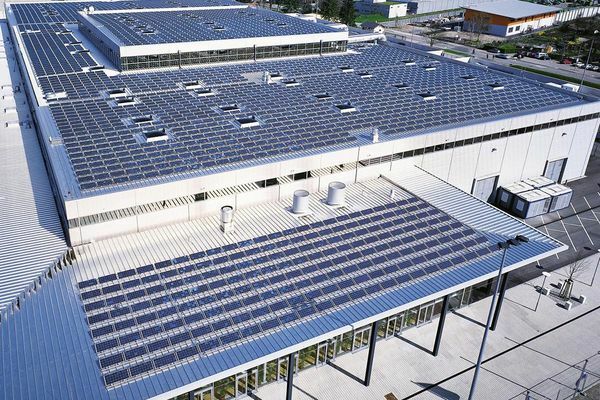 The extension of Freiburg‘s exhibition center in 2006 also saw the installation of the city‘s second largest solar energy system on the roofs of the four halls. These panels produce a total of 650 kilowatt-peak (kWp) per year for the exhibition halls and conference rooms. 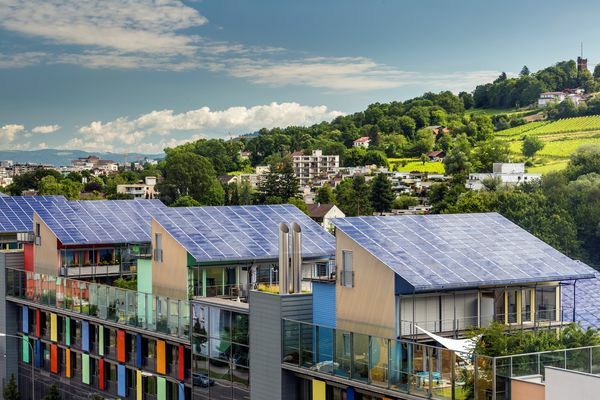 240 solar modules extending over 19 floors combine to create south Germany‘s highest solar power station. The solar tower, which produces 24,000 kWh of electricity each year, was awarded the photovoltaic architecture prize of the state of Baden-Wuerttemberg. 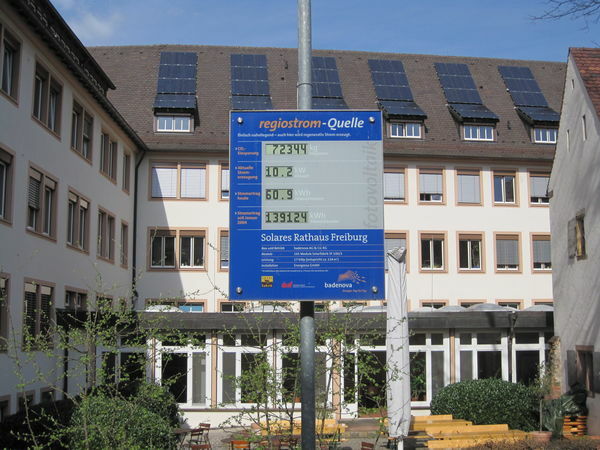 The historical Town Hall of the City of Freiburg has been equipped with solar panels since 2004. The installation produces 16.5 kWp. 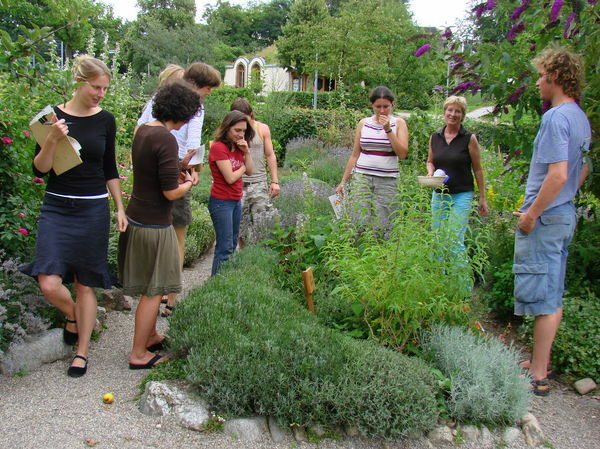 The WaldHaus in Freiburg is an innovative educational center which has the aim of increasing people‘s knowledge of the eco-system of the forest, making them more aware of issues relating to this habitat and creating a consciousness for sustainable approaches to the use of the forests. A varied program of events throughout the year and constantly changing exhibitions appeal to a wide audience. 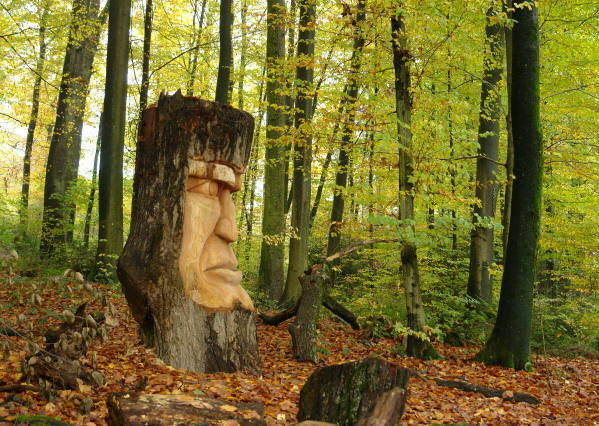 Groups who visit can expect guided tours on different topics, and school classes are welcome to come and experience the green wood Workshop. This center for environmental education, set charmingly in the Seepark (lake park landscape), is located in an attractive green oasis.